For those of you not familiar with the British high street, there used to be a store called Woolworths that was a childhood favourite for a lot of us. Mainly because of the “pick ‘n mix” sweet selection. It was affectionately known as “Woolies”. The store sold general household goods, makeup, books, children’s clothes, toys, records (yes, it goes THAT far back!) and gardening supplies. Woolworths was also known as a teenage shop lifting paradise where I lived. I must hasten to add that I never partook in that! Although tales of school chums browsing in there whilst wearing wellington boots for ease of helping themselves to the “pick n mix” still remain. There are currently stores called Woolworths in South Africa, Dubai and Australia but they are not the same and have different logos. It was a sad day in 2008 for the British when Woolworths entered into administration and was eventually closed, saying farewell to our childhood shopping memories. 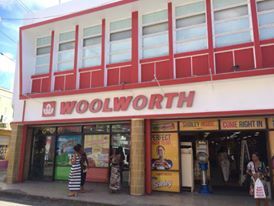 As I was exploring Bridgetown in Barbados, I turned down a side street and was amazed to be greeted by the familiar red logo used by Woolworths of my childhood. I rushed over to the store with the speed of an Olympian athletic to explore inside, expecting it to be like the Woolworths chain that I have experienced in South Africa and Dubai. As I walked through the door I was magically transported back in time. Although there was no “pic ‘n mix” there was a large sweet selection. The range of goods were almost the same! I had to buy something just for the sheer thrill of it and almost exploded with delight when I saw the stick-on price tags with the old Woolworths logo on! Even the paper receipt had the old familiar logo on too! I now pop in there about once a month, to make the inner child in my smile. That, and they do some cheap candle holders too! It truly is like living in the 1980’s here!